A Break from the Holiday Cards! I've been busy prepping and teaching all of my holiday card classes, but had a chance to make a birthday card for a dear friend of mine (that also happens to be my upline at Stampin' Up!). She's a very talented indoor gardener, so I know the Orchid stamp set definietely appealed to her!! I took a couple of minutes to make this card for her!! In real life, this is very pretty. The card base is Fresh Fig, one of my favorite new In Colors from this past summer's release. Here's a bit of a closer look at the card. I used Wink of Stella to "watercolor" the insides of the large flowers. Fresh Fig card base: 4 1/4" x 11", scored at 5 1/2"
Stamp the sentiment from Happy Birthday, Gorgeous in Fresh Fig ink. Cut out with the 2nd smallest Stitched oval framelit. Cut an Old Olive scalloped oval using the next largest scalloped oval from the Layering Ovals framelit set. Stamp the flowers from the Climbing Orchid stamp set, and then cut them out using the coordinating framelits. Make sure to add a little glimmer and glitz using the Clear Wink of Stella glitter brush pen! The Orchid stem is from the Seasonal Layers framelits (the dogwood branch). Just attach the "orchid branch" to the paper, making sure it's in the upper right corner so you have room for your sentiment. Attach the orchids using regular and mini dimensionals. Attach a few rhinestones and you're done!! All ingredients for the card are also listed below for your convenience! Have fun and make a card! Holiday Extravaganza Begins Today, Nov. 20th! Today is the kickoff day for Stampin' Up! 's Holiday Extravaganza so I decided to create a card using one of the stamp sets that's 20% off today only! 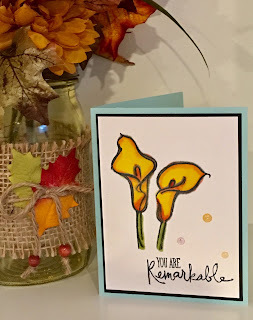 Using Remarkable You, I made a super-quick card with just 3 layers and a couple of embellishments! Since I'm working overnight again tonight and don't usually create in the middle of a nursing stretch, I'm really excited about how easy the card was, but still looks quite beautiful! I used the new Stampin' Blends to color the image after stamping it in Tuxedo Black Memento ink on Shimmer White cardstock. An embellishment that I have hardly used at all are the gorgeous Glitter Enamel Dots! Have you used them? Is there an embellishment that maybe you have ignored or "hoarded" because it's too beautiful?! I challenge you to create a card this week using one of those embellishments. Then ... send that card to somebody special! You'll make their day! Pool Party c/s, 5 1/2" x 8 1/2", scored at 4 1/4"
Basic Black c/s, 3 15/16" x 5 3/16"
Shimmer White c/s, 3 3/4" x 5"
Stamp the Calla Lily image from Remarkable You in Tuxedo Black Memento ink. Stamp the "You Are Remarkable" sentiment in bottom right corner in same ink. 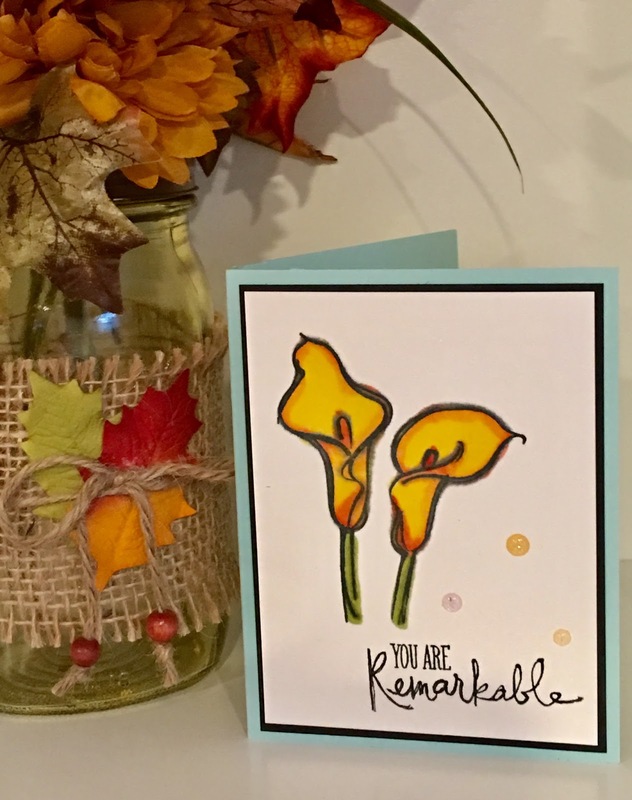 Color in the lilies using your choice of Stampin' Blends markers: I used the light Daffodil Delight marker for the majority of the flowers, but then used both the light and dark Calypso Coral blends to color the lines/outlines. The stem is a blend of the Old Olive light and dark Stampin' Blends. Then, just choose a couple of the gorgeous enamel dots to add dimension to your card and you're done! Now, my challenge to you is to send that card to someone special today!! PS. I have a special to share with you, my customers and friends! During this Holiday Extravaganza, if you make a purchase using the hostess code, 2CEZEZST, I have a special for you. Using this code earns you awesome rewards and gifts from me. Spend $35 and receive 5 handmade cards from me. Spend $50 - receive 5 handmade cards from me + a pack of Year of Cheer Embellishments. Spend $150 - DO NOT use the host code! You'll earn your own Stamping rewards + earn all the above products. You must use the hostess code, 2CEZEZST in order to earn these rewards. Click on the Holiday Extravaganza store for a link to my store and the Holiday Extravaganza special promotion. Just a note, although there are stamps for 20% off during these 24 hours, there are also several items on sale November 20-26th, 2017. Check out the other items too! There are framelits, markers, embellishments and all sorts of special items that you can purchase now!! Have a wonderful day, and find time to create and share what you love!